Excuses, We All Have Them! Happy Friday friends! How crazy is it that we just finished the first week of June?! It seems like yesterday it was the holidays and now we’re doing yard work and hoping the garden does well, especially as we seem to have a major rabbit infestation this year. Anywho, as I’ve shared numerous times this year, Mrs. Frugal Rules and I are on a quest to eat healthier and get in better shape. Truth be told it has been a goal that I’ve had on my mind for a number of years. I would start and do well for a few weeks only to fall off the rails and return to my former ways. Looking back at those attempts I’m confident as to why I didn’t succeed each and every time…it was excuses plain and simple. If you read my good friend Kim’s post on Monday then you know you can’t pay off debt with excuses and the same can be said of eating healthier and losing weight. As I wrote about last week, a recent article of mine for US News was picked up by Yahoo Finance. The article was on cheap ways to eat healthy. One would’ve thought that it was a political article with the way some of the commenters just lit into the premise of the article. At the heart of most of the comments was one thing – excuses. I believe that excuses help us do two things – stay comfortable and believe that the “problem” isn’t to be found within us. Essentially, I believe that excuses allow us to deflect blame from ourselves and not accept responsibility for our choices or decisions. Just like we need to generally point the finger at ourselves when it comes to dealing with things like credit card debt we also need to point the finger at ourselves when it comes to dietary choices. It’s not really meant to come across as judgmental, as I have in the past and probably still make excuses for things. That said, I believe part of the reason why we don’t want to admit to our excuses is because they require us to step out of our comfort zone. They require us to be real with ourselves and our own shortcomings. In essence, we love to cling to them as opposed to take on the challenge of facing them down. You can’t eat healthy on a budget: This is a common one we’ve all heard. Prior to us changing our eating habits we were able to stick to a grocery budget of $475 per month for a family of five. I had serious doubts at first if we’d be able to stick to that. Four full months into our change there has not been a single month we have gone over that budget. That is including quite a bit of organic fruits and vegetables as well. It’s not always easy, but with some hard choices, we’ve been able to make it possible. Food prices are going up: This is definitely true. Beef prices alone are projected to rise by at least 7% this year alone. This does definitely make it a challenge if you choose to eat healthy. However, as said above, if you’re willing to make the hard choices it can be done. Eating healthy takes too much time: I really don’t get this excuse at all. Yes, it’s different, but it does not have to take more time. You can cut a lot of time by pre-cutting vegetables to use for salads throughout the week or freezing them to pull out when you have need for them. Again, it comes down to choices and seeing that just because something comes in a box with instructions doesn’t mean it saves time. Eating healthy is boring: I TOTALLY get this one. A year ago I would have sooner stuck a sharp, rusty nail into my eye than eat an apple. Now, I can’t get enough of them. The key is to give yourself variety. Include fruits and vegetables in smoothies, in different dishes, etc. Then take it one day at a time. As the saying goes, you form a new habit after 21 days and I can personally attest to that. I don’t want to end today’s post on a negative note. Let’s face it, we don’t like being told we’re to blame for our excuses. 🙂 I know I certainly don’t. In light of that, look at the excuses you’re making and use them as motivation to begin to work towards reaching a goal. This can include eating healthy and losing weight to things like paying off debt, to beginning to save for retirement, to so many other things. The beauty is the sky is the limit. Take a look at things you want to achieve but are putting off or being held back from due to excuses and choose to use that as motivation to go after them and achieve them. It likely won’t be easy, but you will be much better off, not to mention happier, by choosing to not listen to those excuses but instead make progress towards reaching your goals. What are some excuses you’re currently struggling with, but not dealing with? What are some common excuses you hear for not choosing to eat healthy? Do you have anything fun planned for the weekend? I think the whole “it takes a lot of time and money to eat healthy” excuse is very widespread, and I’m also victim to it. My wife has turned it upside down, though, by finding ways to get healthy foods for cheap. I don’t know if you have an Aldi in your town, but the prices on fresh produce are something like 50% that of regular grocery stores. Needless to say, we load up on them each weekend and eat a ton of fruits and veggies every week. I agree, it is widespread and we have fallen to it as well in the past. We do have Aldi’s here, we have one about two miles from the house actually. We use them along with Costco and our garden to get a lot of what we need. Great post, John. As you know, I’m choosing the healthy eating route too, and it isn’t always easy. This post applies to SO many things, and it can be really difficult to choose the apple when you’re faced with a bowl of ice cream. But it never fails that when we make the best choices, we feel better all the way around about having overcome the excuse and made the right choice. P.S., get rid of those rabbits by either planting Marigolds around the perimeter of your garden, or setting up a few pinwheels (shiny, spinny things we played with as kids, can often be found at the dollar stores) around the garden. One or both of these should work well for getting rid of the rabbits, as should sprinkling blood meal around the garden, or bordering the garden with onions, but onions don’t do well near peas and green beans, and vice versa. Thanks for the tips on the rabbits. I believe I mentioned to you earlier in the week that we have it set up like Gitmo in the backyard, lol, and that seems to be working for now. Eating healthy was the best life change Ana and I have made in a long time. We started about a year ago and have been able to stay on budget! I don’t really give myself excuses when it comes to eating, but I do have the nasty habit of smoking. I know I can quit, but I always give myself the I’m addicted to a chemical excuse as a reason to smoke. Eventually I will quit, I’ve just got to get past the excuses. That’s awesome Josh! I can understand on the smoking. I used to smoke cigars and gave them up a number of years ago. I know it’s not exactly the same, but was a challenge nonetheless. My Mom and Stepdad gave up smoking a few years back after he had a heart attack and it’s still something they struggle with wanting. You can have your cake and eat it too – so to speak 🙂 Eating healthy does not have to be expensive if you really work at it and turn the excuses upside down as you suggest. One of the biggest ways to save and still eat healthy is to cut down on pre-packaged type stuff. You are paying more to save some of your prep time. Lol, yes, I guess you can. 🙂 Very true though, it doesn’t have to be expensive, you just need to work at it. I could not agree more with that. That stuff may seem convenient, but it’ll cost you in the long run. We eat pretty healthy now – thanks to my fiancee – and it doesn’t break our budget at all. I think we’re actually saving money since we stopped buying junk. We live in an apartment now so we can’t have a garden, but we joined a CSA and we got a lot of vegetables every week. Great for you Aldo! It does save money, which sort of turns the excuse on its head. Nice work on joining a CSA, they’re awesome! Great post! We also eat very healthfully yet frugally. We’ve found that eliminating most meat is the cheapest way to go and incidentally, very healthy too! We focus our grocery budget primarily on fresh fruits and vegetables. And, we make most of our meals entirely from scratch, saving time by cooking our weekday lunches in a big batch on Sundays. There’s a lot of crossover between healthy and frugal if you shop and cook thoughtfully. Thanks for the motivation to stay the course! Thanks! I agree, we have moved to where the large majority of our groceries are fruits, vegetables and other whole foods. I still enjoy beef from time to time, but that has been reigned in as well. I’m trying to get better at eating healthier, and we’re finding that our food bills are about the same. It’s when I want a takeaway or something unhealthy that it begins to rise! We’ve still got a bit to go in terms of perfecting our eating habits, but they’re getting there. No one is perfect Nicola, the key is you’re making strides to improve which is something most don’t even stop to consider. Keep up the good work! I’m convinced that the people who comment on Yahoo Finance are all just really sad and I feel sorry for them. Thanks for supporting no excuses week. I still catch myself using an excuse sometimes, but I’ve really tried to stop that and instead remember 99% or what we do is a choice. The only reason you can’t eat healthy on a budget is if you don’t plan. It’s easy to blame all kinds of stuff, but if people would cut off a couple of hours of TV a week to make a meal and grocery shopping plan, it can be done. Not a problem Kim and I could not agree more. So much of it does come down to choice, though it’s so easy to believe that we’re victims when we really aren’t. Excuses are everywhere. I am trying to get back to eating healthy and working out more than I was in the past. We are also trying to eat out less, hopefully this will mean more money in the bank. Eating healthy and exercising are two things I’ve had on my goals list for a while now, and I can’t seem to make it stick. I’m a very picky eater, so broadening my horizons and being open to tasting different things is also involved. I think I’ve been hiding behind that excuse for a while, though. I just have to try different things and I’ll find something I like! I hear ya E.M. as I’m somewhat picky myself. I didn’t think I could do it and then I just started one day at a time. It sucked at first, but after a few weeks I got into the swing of things and it’s downhill from there. Love this John! Just I love the fact that you are getting healthy this year. Good health is just as important to me as my financial health. We are all guilty of making excuses from time and time, myself included, and I agree we often make them because we don’t want to get out of our comfort zone or are afraid to do so. While I can’t say I approve of those types of excuses, I get them. Fear has held me back before, and it took a conscious effort on my part to push through the fear. I tend to be less forgiving of people who are not willing to take responsibility for their choices. That’s free will, people. Life is about the choices we make. Yes, it can be hard to change habits and beliefs but it can happen. We just have to want it bad enough. Thanks Shannon! I could not agree more. They are both equally important for different yet very much the same reasons when you think about it. Great point about wanting it bad enough. I started and stopped before, but it wasn’t until I truly wanted it that it drove me to push through the excuses and get serious. I don’t know if I really make excuses, but I make many mistakes, and although I own up to them, I still make them, like going over budget on groceries. So is that a step in the right direction? 🙂 At least it IS super healthy stuff! 🙂 Congrats on taking your health so seriously! I spend about $75/month on groceries and eat primarily whole (healthy) foods. It’s not even that difficult. I’m a young male who exercises often, btw. I eat healthy mainly because I want to live a long time and I want to enjoy life. Don’t need my heart working extra hard to flow blood to any extra fat. I try never to make excuses. I know there’s someone else out there with more to complain about than me who’s doing greater things than I am. That’s awesome Will and just goes back to the point that it largely comes down to choices and priorities. That’s a great point! So much comes down to perspective, which is key to have. That tends to be the case Tre, at least as far as we’ve found. I’m too busy to have excuses about why I don’t do lots of the things you mention here. Ha ha, you kill me Joe. I was having this debate about the cost of eating healthy with my MIL. She argued that it’s a lot cheaper to just buy pasta and rice and cook that as opposed to fresh vegetables. I countered with the fact that she could start by cooking vegetables 2-3 times a week in order to reduce the amount of carbs that she eats and it wouldn’t significantly increase her food bill. I also said that she needed to put her health first because she does have high cholesterol. People don’t have to go cold turkey on changing your eating habits, take it one step at a time. I’ve heard that argument a lot as well Kassandra and it just doesn’t hold water most of the time. Going the cooking veggies several times a week is a great option and is one that we have used. That said, I could not agree more – it doesn’t have to be all at once. Start with baby steps and the change will come. 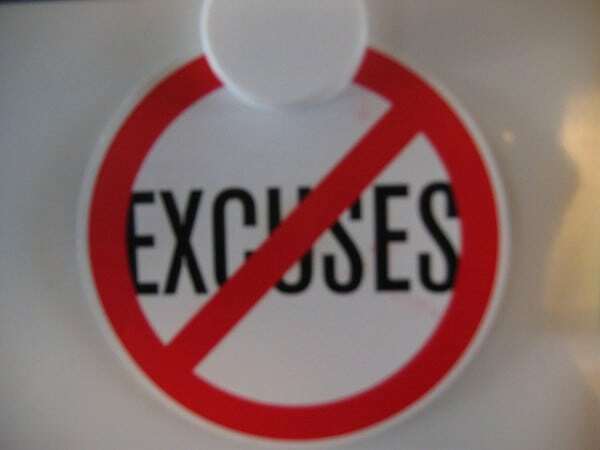 Like you said, we all have our excuses, and I certainly have them. Not getting enough sleep the night before is an excuse I use to avoid getting up in the morning early to get a workout in before the day job. I also use the excuse of having the day job to excuse why I’ve been growing my businesses slower than I’d like to. Excuses boil down to “I have this problem, and I’m too lazy to solve it”. Any worthwhile achievement requires that you exercise and use your problem solving faculties … and it’s easier the more you do it! I would tend to agree Tom. Yes, it requires work but it gets easier the more you work at it. You know how they say guilt is a wasted emotion? Well excuses are a wasted approach. Not gonna get you anyway and just delays progress. Even a small step forward is better than nothing or possibly going backwards while thowing out excuses. Great post and enjoyed Kim’s as well! That’s a great point Deb! Yes, it does delay progress and sadly many don’t even see that.